Partners: University of Missouri | DayTranslations, Inc.
We at Day Translations, Inc. espouse the idea that giving back to the community makes good business sense. We provide top-quality translation and interpreting services to various individuals, corporations and organizations located around the world. At the same time we put great value in academic excellence and education. With our work, we are exposed to a multicultural community and thus know the difficulties faced by people who do not speak a language predominantly used in the country where they currently live in. Multicultural diversity is very prevalent in the United States and it is an age-long phenomenon, which actually contributed to the rich culture of the U.S.
Day Translations has partnered with several institutes of higher learning and this time, we are proudly announcing the discount program we are extending to the faculty, students and staff of the University of Missouri.. The University of Missouri, also called UM or Mizzou, is a public research university established in 1839 in the state of Missouri. It is the largest university in the state, with an enrollment of 35,441. The university offers more than 300 degree programs. It has 19 colleges, with campuses located in St. Louis, Kansas City and Rolla. The university is a member of the Association of American Universities and ranks 99th among national universities in the 2015 U.S. News & World Report. It holds the distinction of being one of only six public universities in the entire United States where the school of law, agriculture, engineering, medicine and veterinary medicine are found in just one campus. The Carnegie Foundation for the Advancement of Teaching designated Mizzou as a Doctoral/Research Extensive university. The international students at Mizzou come from about 100 countries, which make the university’s student body quite diverse. With this outlook, there is a lot of potential for these students to require translation and interpreting services now and in the future. Day Translations is available 24 hours a day, seven days a week to service the language services needs of the students, faculty and staff of the UM. We offer general document translation, book, manual and journal translations, academic evaluation and translation services for immigration requirements. 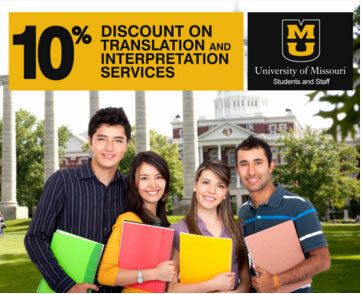 Day Translations is extending a 10 percent discount on all our translation and interpreting services for the faculty, students and staff of the University of Missouri whenever they need them. They can redeem the discount by sending an email to contact@daytranslations.com and showing proof that they are students, faculty member or staff of the University of Missouri.